View of Scarborough in North Yorkshire, on the east coast of England. By the 19th century Scarborough had become an important port and was well known for its ship building industry. The development of the railway network encouraged more people to travel to Scarborough for leisure and it soon developed into a seaside resort. 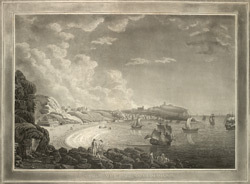 Large hotels on the seafront attracted wealthy guests who liked to walk along the cliffs and beach.